Over 175 Quick-and-Easy Fat-Free and Low-Fat Vegan Recipes. This book will; save you money by using everyday inexpensive ingredients, save you time with easy no fuss recipes, and improve your health with each nutritional bite. After vegan chef Lindsay S. Nixon wrapped up her popular cookbook The Happy Herbivore Cookbook, she went back to her kitchen in her new home in the Caribean. Island living encouraged Nixon to come up with simpler fare, which led to this follow-up cookbook focusing on recipes that emphasizes tasty with quick-and-easy. Now, in Nixon's much-anticipated follow-up cookbook, Everyday Happy Herbivore, readers will see, once again, that just because plant-based eating is optimal for health, does not make it expensive or time-consuming. 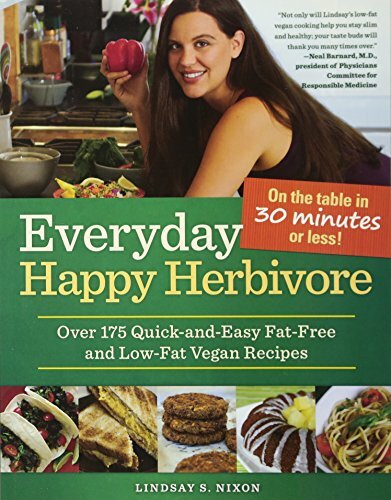 Everyday Happy Herbivore includes more than 175 easily done recipes—recipes that are so quick and easy, you can cook three healthy meals from scratch every day as Nixon does. Each of Nixon's recipes are made with wholesome, easy-to-find, fresh ingredients and include no added fats. With additional notes indicating recipes that are ideal for preparing ahead of time and those you can whip up with just a few dollars, Everyday Happy Herbivore will be THE must-have cookbook for anyone desiring a healthier, happier menu! Now, in Nixon's much-anticipated follow-up cookbook, Everyday Happy Herbivore, readers will see, once again, that just because plant-based eating is optimal for health, it doesn't have to also be expensive or time-consuming. Everyday Happy Herbivore includes more than 175 doable recipes--recipes that are so quick and easy, you could cook three healthy meals from scratch every day like Nixon does. Each of Nixon's recipes are made with wholesome, easy-to-find, fresh ingredients and include no added fats. With additional notes indicating recipes that are ideal for preparing ahead of time and those you can whip up with just a few dollars, Everyday Happy Herbivore will be the must-have cookbook for anyone desiring a healthier, happier menu!